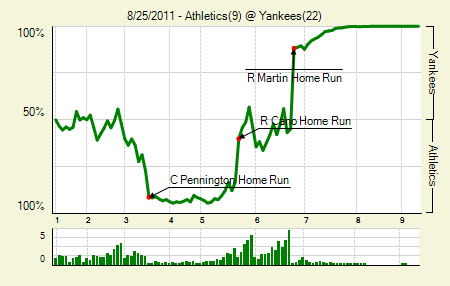 Moving the Needle: Russell Martin‘s grand slam put the Yankees on top, +.431 WPA. The A’s had Phil Hughes’s number, tagging him for six runs in 2.2 innings. It was 7-1 by the end of the third, which, after the way the first two games of this series had gone, seemed a lot bigger. 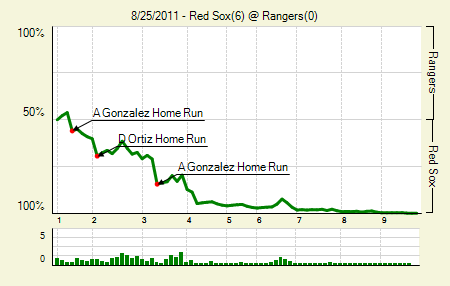 But then the Yankees battled back the way they know how: with the homer. Martin hit a solo shot in the fourth, Robinson Cano smacked a grand slam in the fifth, and then Martin added a grand slam of his own in the sixth, which brought the Yankees all the way back. It was 10-7 then, but as the final score indicates the runs kept flowing. In the seventh they added six runs, and in the eighth they added another six, including another grand slam. The Ynakees set a major league record with three grand slams in one game. Curtis Granderson: 2 for 4, 1 HR, 2 BB. His homer was the record-breaking grand slam. Derek Jeter: 3 for 6, 1 3B, 1 BB. He’s now hitting .358/.405/.480 since coming off the DL. Moving the Needle: Craig Tatum’s double scores a pair, +.244 WPA. 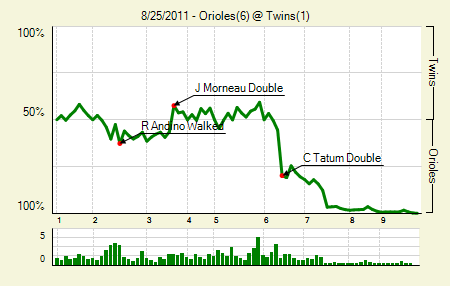 The final score might look ugly, but for a good portion of this game the O’s and Twins remained tied. In fact, the Twins had their chances, loading the bases with two outs in the fifth, but couldn’t come through. The Orioles then pounced in the next inning, getting a single and walk ahead of Tatum’s double, which scored both runners. Mark Reynolds: 1 for 5, 1 HR. His three-run homer really busted open the game. It was the only extra base hit for the O’s other than Tatum. Jo-Jo Reyes: 6 IP, 5 H, 1 R, 4 BB, 3 K. I’m going to go ahead and guess that it was more the Twins lineup than his effective pitching. 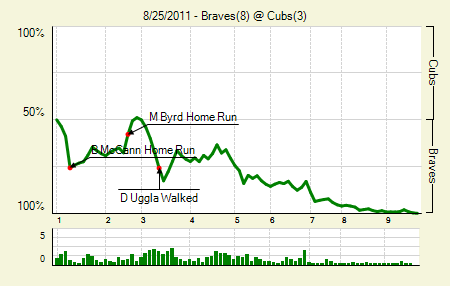 Moving the Needle: Brian McCann’s first-inning, three-run homer stakes the Braves to an early lead, +.169 WPA. Matt Garza put the Cubs in an early hole, allowing a single and then committing an error before serving up McCann’s first homer of the day. The shot made it 3-0 Braves, though the Cubs would make that up in the next two innings. The Braves finally had their response in the third, loading the bases with none out and then getting a walk and single to make it 5-3. McCann later put a bow on it with a solo homer. Michael Bourn: 4 for 5. All singles, but as I say, it’s still four hits in a game. He also scored twice, as did each of the first three hitters in the Braves order. Brandon Beachy: 6 IP, 6 H, 3 R, 0 BB, 8 K. In his last four starts he’s gone 24 IP, 19 H, 8 R, 4 BB, 33 K. The only thing he really has to build is his stamina; he’s averaging under six innings per start this year. Moving the Needle: Chris Young’s two-run shot puts the Diamondbacks on the board, +.272 WPA. For five innings the two teams remained scoreless, but in the sixth the DBack struck. Their 3-4 combo, Justin Upton and Young, came through: Upton with the single and Young with the two-run homer. The DBacks then tacked on more in the eighth, including quite the shot from Paul Goldschmidt. Wade Miley: 6 IP, 5 H, 0 R, 4 BB, 4 K. He’s been all over the place in his first two starts. In his major league debut he allowed five runs in four innings. Paul Goldschmidt: 3 for 4, 1 HR, 1 BB. He wasn’t playing a ton when he first came up, but he’s certainly earned his starts. 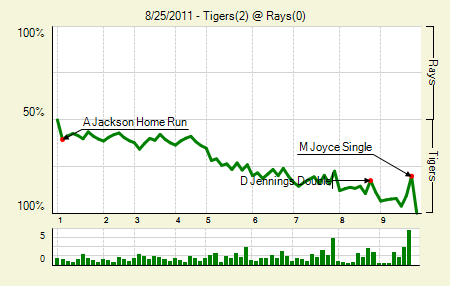 Moving the Needle: Sam Fuld lines out and Matt Joyce gets caught off first, -.199 WPA. The Rays trailed 2-0 in the ninth, but they put runners on first and third with one out. That brought Fuld to the plate, who lined one out to right. Joyce, however, was going with the pitch, so when Ryan Raburn caught it he easily fired back to first to finish the double play and end the game. That’s two curious endings in two days for the Tigers and Rays. Jeremy Hellickson: 7 IP, 6 H, 2 R, 1 BB, 7 K. He allowed a leadoff homer and really came back to pitch well after that. Doug Fister: 7 IP, 5 H, 0 R, 0 BB, 5 K. That’s the guy they thought would help them in the playoff run. Moving the Needle: David Freese comes through with a bases loaded single, +.197 WPA. The Cardinals jumped out to an early lead, but Edwin Jackson let the Pirates back in it. By the end of the fourth the Pirates led 4-3. In the fifth, though, the Cardinals got their offense going, getting a single and two walks to load the bases. 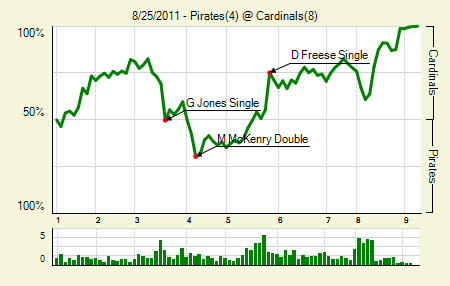 Freese then came through with a liner to right, which scored a pair and put the Cards back on top. Albert Pujols: 1 for 2, 1 2B, 3 BB. He scored three runs. Allen Craig: 2 for 4, 1 2B. 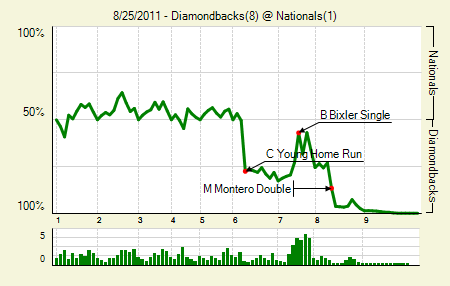 Moving the Needle: Adrian Gonzalez’s second homer busts open the game, +.135 WPA. The Red Sox put on a home run clinic, scoring all six of their runs on four homers. Gonzalez hit two of them, a solo shot in the first and then a two-run homer in the third to make it 4-0. And that, really, is the story of the game. Andrew Miller: 6.1 IP, 3 H, 0 R, 2 BB, 6 K. Think the Rangers offense was off just a bit? Jarrod Saltalamacchia: 2 for 4, 1 HR. He hit a two-run shot to make it 6-0. David Ortiz added a solo shot. 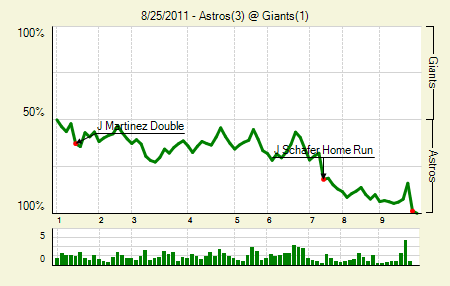 Moving the Needle: Pablo Sandoval grounds into a double play to end the game, -.149 WPA. The Giants trailed 3-1 in the bottom of the ninth, but they had Carlos Beltran on base and Sandoval at the plate with one out. Surely they had a fighting chance. But Sandoval grounded one sharply to first. Carlos Lee stepped on the bag and threw to second, starting a short rundown that ended with Lee running down Beltran. Jordan Schafer: 2 for 4, 1 HR, 1 BB. He scored three times. That’s his first extra base hit as an Astro. Henry Sosa: 6 IP, 4 H, 1 R, 3 BB, 3 K. Again, peripherals aren’t swell, but this is the first time in his career he’s not allowed four runs in a start. 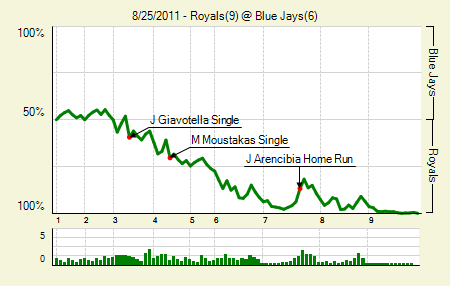 Moving the Needle: Johnny Giavotella puts the Royals on the board with an RBI single, +.112 WPA. It’s odd to see the first run of the game move the needle furthest in a 9-6 bout, but that’s the way it went last night. Giavotella took advantage with a man on second and put the Royals on the board. They continued tacking on from there, going up 5-0 before the Blue Jays made a peep. Billy Butler: 4 for 5, 2 2B. He drove in two and scored two. Melky Cabrera: 3 for 5, 1 2B, 1 HR. His career year continues. We hoped you liked reading The Morning After: Game Recaps for August 25th by Joe Pawlikowski! Nothing to do with any of the games last night but I thought BB2N did a good job simply explaining wOBA to the masses. They gave a fair evaluation of why it is a tremendous stat. I agree. It was really well done and I liked that they got perspective from ex-players (Schilling and Larkin). I agree except when it comes to their analysts. I find Harold Reynolds and Mitch Williams unwatchable. I cringe when I hear them discuss MVP voting. The game coverage is superior in nearly every way though and the other shows like you mentioned are great. I think Harold is awesome but sometimes he says things you have to completely disagree with. Pre-season he said Derek Jeter is the best shortstop in baseball. Look I’m a die hard Yankees fan and I really like Jeter but that is just bizarre. Mitch Williams I do find very annoying. He’s even shown rooting for teams on the air. Harold is an in the closet Yankee fan. Mitch is a self-exposed Yankee hater. I am not crazy about the analysts myself, but I don’t think there are any good ones on either of the shows (Maybe Tim Kurkjian and Peter Gammons). Kurkjian I don’t think has done MLB Network, Gammons has done both. I did like Harold on Baseball Tonight though.